CINCINNATI, Ohio -- The Cincinnati Zoo reopened its gorilla exhibit Tuesday with a higher, reinforced barrier installed after a young boy got into the exhibit and was dragged by a 400-pound gorilla, which was then shot and killed. The exhibit's reopening came a day after Hamilton County Prosecutor Joe Deters said he would not bring charges against the boy's mother, who was tending to another child when her 3-year-old "just scampered off," as children sometimes do. The barrier, which had passed repeated inspections by the Association of Zoos and Aquariums, will now be 42 inches high - a half-foot taller than before - with solid wood beams at the top and bottom, plus knotted rope netting at the bottom, the zoo said. Surveillance cameras also were added. Director Thane Maynard said the exhibit had been safe for 38 years, but the new barrier helps to reassure guests and protect everyone on both sides of it henceforward. It "redoubles our effort to make sure that our animals are safe and that our visitors are as well," Maynard said. The boy apparently climbed over the previous barrier May 28, made his way through some bushes and fell about 15 feet into a shallow moat. 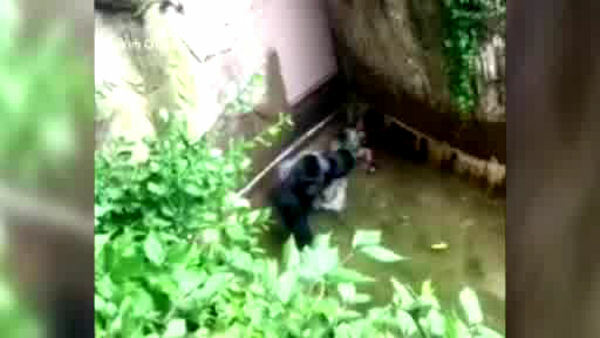 A special response team shot the agitated, 17-year-old gorilla to protect the boy, who was treated for scrapes. Cincinnati resident Rebekah Ridgeway was visiting with her 7-year-old daughter as the exhibit reopened and said while the previous barrier was good, she feels more comfortable as a parent with the new fencing that visitors can see over but that blocks someone from climbing through. "It was shocking to hear something like that happen at this zoo, because we know that they have such good safety measures here," she said. "So it was really heartbreaking for Harambe the gorilla, as well as for the child and their family." The gorilla's killing set off a torrent of criticism online, with some commenters vilifying the zoo for shooting the animal and others blaming the boy's mother for not watching her child more closely. The family has said the boy is doing well and they're taking steps to put the "tragic episode" behind them. Deters said he has been a bit surprised by the reaction to the gorilla's death. He said the zoo suffered a great loss, "but it's still an animal. It does not equate human life, and they felt that this boy's life was in jeopardy, and they made the painful choice to do what they did." The zoo's actions will be reviewed separately by the U.S. Department of Agriculture. An animal protection group has urged that the zoo be fined. The zoo says its 10 remaining gorillas are doing well. Two are 20-year-old females that were grouped with Harambe. The others are a family group of eight, led by a silverback named Jomo.